World class technical mountaineering jacket. 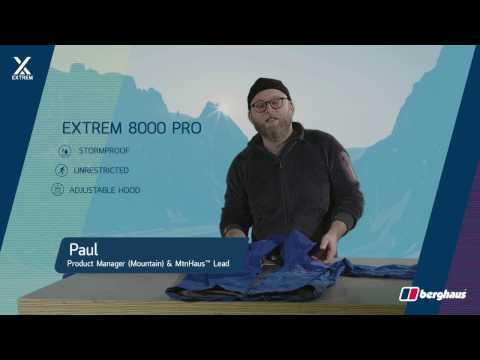 The Extrem 8000 Pro is the perfect balance of weight, durability and breathability combined with exceptional tailoring. The result is a serious mountain jacket that gives you everything you need, leaving you to work the challenge. Pure performance MtnHaus engineering, the Extrem 8000 Pro is a feature-packed jacket with innovation at its core. The new XpanseBack system uses unique panelling and design to deliver a 20% increase in freedom of movement and an amplified rear-ventilation. The XpanseHood will revolutionise hood management; a magnetic expansion fold contracts when not needed, solving the issue of excess material when using without a helmet. The impressive feature set is matched with the most breathable GORE-TEX Pro available to give extreme levels of moisture management, durability and comfort.